2013 marked the 14th annual edition of the No Finish Line Race in Monaco and this year’s race was a great success as always. Despite the difficult weather conditions which lead to the circuit being shut for almost 12 hours, 271,251.38 km total were walked or run by the various teams and individuals who took part over the 8 day period. To celebrate the start of the race, the Hotel Métropole in conjunction with the Peace and Sport charity hosted a luncheon for some of the Champions for Peace from Peace and Sport, the Monaco-based charity who supported the race and who ran all week down at the track in the Port Hercule. The Champions for Peace are top-level sports champions who are either still active or have retired from their sports career and who wish to help disadvantaged communities through sport. Those champions invited to the luncheon at the Hotel Metropole included pole vaulter Yelena Isinbaeva, double Olympic champion, triple World Champion and European champion, Wilson Kipketer, Olympic silver medalist and 800 metres World Champion, World Champion long distance runner Paula Radcliffe and Charmaine Crooks Olympic silver medalist and 800 metres World Champion (both pictured below), and Steve Cram, Olympic silver medalist and the first man to run 1500 metres under 3 minutes and 30 seconds. The aim of the Peace and Sport charity is to promote the practice of structured sport and sporting values to educate young generations and help foster social stability, reconciliation and dialogue between communities. Since its creation in 1999, No Finish Line has had over 46,336 participants, and has raised over 1,328,315 € for children’s charities around the world. Riviera Buzz managed to catch up with 2 of the Champions for Peace during the luncheon and ask them about their participation in the No Finish Line and also their role within the Peace and Sport foundation. 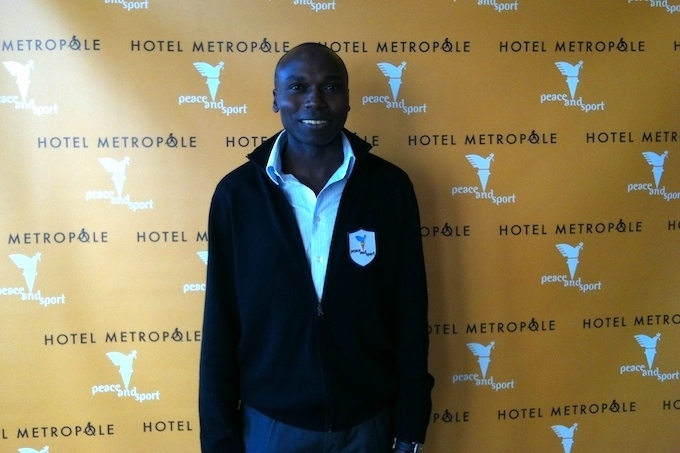 First off, we managed to grab a quick interview with Monaco resident and star of the track Wilson Kipketer. Wilson (pictured in lead image) was a three-time World Champion of 800m between 1995 and 1999, held world records for indoor and outdoor middle-distance running for over a decade and won a silver medal at the 2000 Olympics, and a bronze medal at the 2004 Games. He has been involved with Peace and Sport for seven years and regularly attends events around the world to promote the cause of the charity as a Champion for Peace. Wilson, how did you become involved with the charity Peace and Sport? I was invited to a Peace and Sport event seven years ago here in Monaco which I attended and very much enjoyed. The following year I was invited back again and then Peace and Sport asked me to become one of their Champions for Peace which was an honour I was happy to accept. I live in Monaco and have competed (RB and won!) several events here so this was a great opportunity for me to become involved with something I care about. And what do you feel you contribute to the charity? You know, I am an athlete and I know from personal experience that sport can transform people. Sport transforms normal people into champions and gives them self-confidence. In sport, size and body weight don’t matter, everybody can find a sport to suit their own skills and talent. I hope to be able to share that with children to give them hope for the future. Well, sport is a great leveler. There is no race, religion or colour in sport, it is about humanity. Kids don’t see colour, instead they look up to sporting heroes and try to emulate them. Once the kids become involved with team or individual sports, the parents become involved too and sport becomes a talking point and a focus for the family. We Champions for Peace have an incredible opportunity to spread goodwill through sport. Arts, music, sport these are all things that are at the core of human life, since the time of the Ancient Greeks, sport has been used as a tool to bring communities together and help them invest and grow. And on a wider scale, how can sport help rehabilitate poor communities/countries? Sport helps to foster a sense of community. In areas where Governments are not investing money, we have a chance to bring people together over a football match or a race track. And sport can also bring a sense of pride to people. During the Olympic Games, sportsmen and women represent their country, sing their national anthem and wave their national flag, and the people watching at home are proud to belong to their nation, especially the smaller countries who do not always get a chance to make their voices heard. What do you hope will be your legacy as a Champion for Peace? The legacy of the Champions for Peace is the fact that we have managed to bring together these incredible men and women and unite them for a great cause. These athletes are heroes and their positive attitude will inspire a new generation of heroes. And finally are you hoping to set any new world records down on the NFL track this year? Unfortunately I can only take part for a couple of days as I’m travelling for the rest of the week so I don’t think I’ll be breaking any records, but I will definitely be putting in some laps over the weekend! William, why did you first decide to participate in the No Finish Line? Well, originally I decided to take part for a number of reasons. No Finish Line is a unique and quite different event. It takes place under Royal Patronage and is well placed during the year with regards to the other races, so it allows me to compete more frequently, the weather is usually good in Monaco at this time of year, and also it’s an 8 day event. Is the No Finish Line a popular event in the ultra-running community? Yes definitely, it’s an event which has grown enormously in popularity and size since the first edition in 1999. Every year there is more publicity, more recognition and more people running which has really put the NFL on the map. What’s also nice are the add-on events which are celebrated or have grown up round the race, the Fête du Prince, the fairground, the women’s high-heel dash, it’s amazing to see how the event has developed over the years. And how did you become a member of the Hotel Métropole Peace and Sport team? When I was running in the NFL in 2011, I was approached by a fellow runner who turned out to be Jean-Claude Messant, the General Manager of the Hotel Métropole. We became friendly and after I won the race he offered to keep the NFL trophy at the hotel and send it on to Scotland for me after I went home, which he duly did. We kept in touch and the following year he asked me to join the Hotel Métropole team and run with them which I did, and 2013 is now the second year running I’ve run for them. What does being a member of the Hotel Métropole Peace and Sport team mean to you? It’s amazing to be part of this event; sport naturally develops great leaders and allows us to meet people. Sport is also a means to establish a rapport between all nationalities, races and countries. As an example table tennis which was my first sport before marathon or ultra-running has been used by North & South Korea and by China & the US as a means of getting people talking with the most famous example of this being Nixon’s “ping-pong diplomacy” (In 1971 the US Table Tennis team and accompanying journalists became the first American delegation to set foot in the Chinese capital since 1949 following an invitation from the People’s Republic.) These countries would never have agreed to sit down together in a meeting but the idea of a table tennis match brought them together. And so how did you go from being a Table Tennis champion to Marathon and Ultra-running? I played table tennis to an international standard up until 1981, and running was part of my fitness training. I then started competing in marathons, and after running a few marathons in less than 3 hours I progressed to running ultra-marathons. It was really a very organic development, I had a talent for running, and an intense personal curiosity and desire to see how far I could go. I won my debut 100km, 24 Hour, 72 hours, 6 day, 7 and 8 days events and enjoyed the feeling of accomplishment that comes from running an ultra-marathon. Some of the races you compete in are absolutely grueling, how do you prepare for an ultra-marathon? I’m lucky in that I love running and I love ultra-marathons, I enjoy all the highs and lows of each race. With the concept of long-distance running, I use segmentation to visualize the race. I divide the race into segments of 4-5 hours and then plan what I’m going to achieve during that segment. I check my time after each segment but really an ultra-marathon is all about concentrating on the next hour to come and getting through the incredible fatigue, I am definitely not thinking about the finish line whilst I’m running. With regards to training, running keeps my joints and body fit, but recovery is as important as performance. I really focus on my recovery following a plan I have built up over the years on how to train and recover. Injuries are rife in ultra-running, but by concentrating on my recovery and building up my training slowly I manage to avoid them and my last injury was back in 2001. And aside from running, how else do you prepare for an event like the No Finish Line? Well, I use a weight vest that weighs around 7-8% of my bodyweight to run with and I concentrate on building my strength up slowly before a race. I have a physiotherapist to give me massages and to help me stretch and I also use a variety of flexibility, plyometric and self-hypnotism techniques, a real package of training methods. I’m also very lucky as I have a great support team. Honestly, I’m still as excited to participate in ultra-races today as I was with my first 100km race, to me ultra-running and all that goes with it are still thrilling. In the run-up to your 60th Birthday you set yourself a 60@60 challenge whereby you aimed to set 60 ultra-distance records before your 60th birthday on October 1st 2013. But you went above and beyond setting 70 records by the 1st October- congratulations! So what’s next, do you have a new challenge planned? Yes the 60@60 challenge was great, in setting my personal goals I try to make them both doable and challenging at the same time. Every time I break a record it creates an impetus which then helps me to set another record. Following up from the 60@60 challenge I have now created Project165 which I launched on my 60th birthday. My new aim is to set 165 ultra-distance records before my 65th birthday on October 1st 2018, and I’m hoping to set some new records this week during the No Finish Line here in Monaco. Obviously anything can happen during a race, tiredness, illness are all factors to consider so I can’t be complacent, but that’s all part of the game and I’m in good form and ready to run! William Sichel finished the 2013 No Finish Line in 2nd place overall and logged up an incredible 862.64 km during the week, despite the adverse weather conditions and track closure. Riviera Buzz would like to extend a huge thank you to both William and Wilson for their time and their generosity and we hope to see both of them at the 15th edition of the No Finish Line next November!